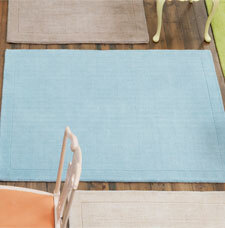 York is a handmade modern wool rugs collection available in a multitude of solid colours. The rugs are made of pure new wool and have a simple striped design made in a cut & loop texture but using the same colours as the background. In addition, the rugs also feature hand-carving around the stripes, which create that distinct bordered design. York rugs are perfect for adding a bit of colour to any room.